I am using Texshop. I created a file there and saved it then there are 5 files saved but no of them is about my source code. Please tell me how can I access my source code so that I could edit it? The source file is my-file.tex. You can probably access it through the File -> Open Recent menu from within TeXShop (assuming your Mac preferences are set up that way). 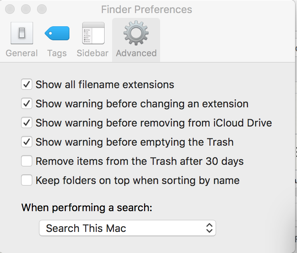 Depending on how your Finder is set up, the extensions may or may not be shown. I find it helpful to always show file extensions in the Finder. You can do this by going to the Finder Preferences -> Advanced and clicking on Show All Filename Extensions. If the file opens with the wrong application, select the file in the Finder and choose Get Info. From there you can choose the application to open the file with. Choose TeXShop and click the box that says Open All with this application. See How to change my default TeX editor under Mac OS X? Not the answer you're looking for? Browse other questions tagged editors texshop macos or ask your own question. How to change my default TeX editor under Mac OS X? How to type Cyrillique TeX source code? How to add markdown engine to TeXShop? How do I get back to the source window in TeXShop?